Halloween kicks off with Zombie Apocalypse, as part of SyFy’s launch of a new slate of holiday-themed Saturday Original movies. Zombie Apocalypse, stars GoldenGlobe winner Ving Rhames (Pulp Fiction, Mission Impossible, Dawn of the Dead), and will premiere tonight, Saturday, October 29 at 9PM (ET/PT). In the Halloween-themed Zombie Apocalypse, a zombie plague has wiped out 90 percent of the world’s population. A small group of survivors, led by Rhames, fight their way across the United States to a rumored refuge on the island of Catalina. The movie also features Taryn Manning (Hawaii Five-O, Sons of Anarchy). SyFy plans other holiday themed movies for Christmas and St. Patrick’s Day. Throughout its thrilling third season, Syfy’s Warehouse 13 has taken viewers on surprising twists and turns, from the return of Myka (Joanne Kelly), the introduction of new Agent Steve Jinks (Aaron Ashmore) and guest stars such as Jeri Ryan, Jaime Murray, Lindsay Wagner and Kate Mulgrew to nefarious villains like Anthony Michael Hall and Sasha Roiz threatening the survival of the Warehouse – and the world. To conclude this powerful year, Syfy will present its first ever, explosive two-hour Warehouse 13 season finale on Monday, October 3 from 9-11PM (ET/PT). Caprica star Alessandra Torresani will guest star on Syfy’s hit series Warehouse 13, portraying a young girl with devastating hidden powers, on Monday, September 12 at 9PM (ET/PT). In Monday’s episode “Shadows,” Megan’s (Torresani) destructive power seems to violently incinerate those around her. In trying to deal with this ability, Megan finds an unexpected confidante and friend in Claudia (Allison Scagliotti). Anthony Michael Hall (“Sykes”), Sasha Roiz (“Marcus”) and Kate Mulgrew (“Jane”) also return to the Warehouse on September 12. The most successful series in Syfy’s 18-year history, Warehouse 13 follows a team of government agents who work at a massive, top-secret storage facility in windswept South Dakota which houses every strange artifact, mysterious relic, fantastical object and preternatural souvenir ever collected by the U.S. government. The Warehouse’s caretaker Artie Nielsen (Saul Rubinek) charges Pete Lattimer (Eddie McClintock), Myka Bering (Joanne Kelly), aspiring agent Claudia Donovan (Allison Scagliotti) and newcomer Steve Jinks (Aaron Ashmore) with chasing down reports of supernatural and paranormal activity in search of new objects to cache at the Warehouse, as well as helping him to control the Warehouse itself. CCH Pounder plays the Warehouse’s mysterious caretaker, Mrs. Frederic. Check out this great cast, awesome guests, and overall terrific sci-fi! Production has begun in Vancouver on Syfy’s highly anticipated 2-hour pilot, Battlestar Galactica: Blood & Chrome, the all-new chapter in the Battlestar Galactica saga which chronicles young William Adama’s adventures in the first Cylon War. Universal Cable Productions will produce the event with Syfy, utilizing cutting edge CGI and virtual technology. Battlestar Galactica: Blood & Chrome takes place in the 10th year of the first Cylon war. As the battle between humans and their creation, the sentient robotic Cylons, rages across the 12 colonial worlds, a young, talented fighter pilot, William Adama (Luke Pasqualino), finds himself assigned to one of the most powerful Battlestars in the Colonial fleet: the Galactica. Full of ambition and in pursuit of the intense action that the Cylon war promises, Adama quickly find himself at odds with Coker (Ben Cotton), the battle-weary officer to whom he reports. With 47 days left in his tour of duty, Coker desires an end to battle just as much as Adama craves the start of it. Though they clash at first, the two men forge an unlikely bond when a routine mission turns dangerous and becomes a pivotal one for the desperate fleet. Joining Pasqualino and Cotton in the cast is Lili Bordan, who will play Dr. Beka Kelly, a Ph.D. who worked for Graystone Industries that created the Cylon robots. Currently assigned to a secret military mission, Beka and Adama quickly establish a rapport. From the award-winning producers of Battlestar Galactica, this new action-packed chapter of the BSG canon was written by Michael Taylor form a story by David Eick, Taylor and Bradley Thompson & David Weddle and directed by Jonas Pate. David Eick, Jonas Pate and Michael Taylor will serve as executive producers. Warehouse 13, Syfy’s most successful series ever, began production on its third season in Toronto on February 9, with key questions left hanging from the gripping season two finale. Has Myka Bering [Joanne Kelly] left the Warehouse team for good? Have we seen the last of villainous H.G. Wells [Jaime Murray]? The series will return with 13 new episodes beginning this summer. The series follows two Secret Service agents who find themselves abruptly transferred to a massive, top-secret storage facility in windswept South Dakota which houses every strange artifact, mysterious relic, fantastical object and preternatural souvenir ever collected by the U.S. government. The Warehouse’s caretaker Artie Nielsen [Saul Rubinek] charges Agents Pete Lattimer [Eddie McClintock] and Myka Bering [Kelly] with chasing down reports of supernatural and paranormal activity in search of new objects to cache at the Warehouse, as well as helping him to control the Warehouse itself. Allison Scagliotti plays Claudia Donovan, Artie’s apprentice. Warehouse 13 received its first ever Emmy nomination in 2010 with a nod for Outstanding Main Title Theme Music by composer Ed Rogers. It is produced for Syfy by Universal Cable Productions. Executive Producer and Showrunner is Jack Kenny (The Book of Daniel). During its second season, the series averaged 3.43 million total viewers, 1.51 million Adults 18-49, 1.80 million Adults 25-54 and a 2.4 household rating, based on DVR Live +7 data, making it the most watched Syfy series of 2010. Check SyFy listing for repeats until the summer’s third season premiere. Players eagerly awaiting Battlestar Galactica Online, the highly anticipated space combat MMOG from Bigpoint, can get a ‘jump’ on the competition and be the first to launch a Colonial Viper or Cylon Raider by visiting Syfy.com and Syfy.co.uk where the open beta for the new game will be available exclusively for ONE WEEK ONLY beginning today Tuesday, February 8th (date may be subject to change). Also available to players only at Syfy.com and international Syfy Universal websites are a frakkin’ awesome set of Syfy-inspired Viper and Raider designs, which players can choose to represent them in the on-going battle between the Colonial and Cylon fleets. Battlestar Galactica Online (http://battlestar-galactica.bigpoint.com/) is a free-to-play, browser-based space combat MMOG that combines high-quality, 3D graphics with intense gameplay. Bigpoint, the global market leader in browser-based massively multiplayer online games (MMOGs), designed and produced the game, which is based on Syfy’s award-winning, internationally popular television series Battlestar Galactica. In addition to the exclusive one week open beta period at the US and UK Syfy sites, Syfy will also be Bigpoint’s exclusive media partner for a period of six weeks with exclusive marketing rights in the US (http://www.syfy.com/battlestargalacticaonline) and UK (http://www.syfy.co.uk/battlestar-galactica-game). SyFy’s popular new program Hollywood Treasure is a different type of reality-based show. It has a premise and format that hooks the viewer through the presentation of interesting Hollywood memorabilia, while tapping into the curiosity factor of wanting to know not only how much they are worth but what others are ultimately willing to pay for them. The show has an addictive, quick-paced formula basically consisting of three ‘hooks’ and each week presents two half-hour episodes. There are even special auctions held to benefit charity. And the best part is that SyFy also makes it possible for viewers to take part in auctions. This includes unique items from fan favorites Battlestar Galactica, Caprica, Warehouse 13, as well as trip packages for Comic Con with VIP access, and an all-expense paid weekend with the Ghost Hunters. You can also get your hands on scripts signed by the cast of Stargate Universe or Warehouse 13. Or how about the purple dress worn by Alessandra Torresani on Caprica? These and many other items are now up for grabs to the highest bidder. Jeanie’s bottle. We all wanted one at some point in time. All the girls wanted to be that pretty genie with the magical powers, and all the boys dreamed of having a hot genie like Barbara Eden to command. For those growing up with I Dream of Jeanie, or who watched the syndicated show many years later, the bottle represents irreplaceable memories of another era. And if you’re lucky enough, you might actually be able to own it now. The bottle that made Barbara Eden famous lives in her home office and will be up for auction, provided Joe Maddalena — the world’s leading authority on entertainment memorabilia — is able to convince its owner to part with it. There are many more unique items from Hollywood history including the Jupiter II Space Pod from Lost in Space; the biplane miniature from the original King Kong; Teal’C Jaffa costume from Stargate SG-1; the magic carpet bag held by Mary Poppins; and the Wicked Witch’s hat from the Wizard of Oz. In the end, you will not believe some of the final winning bids! It appears that memorabilia collecting is serious business. Yet despite some of those jaw-dropping numbers, the stories that go along with these distinctive items are even more fascinating. For a fascinating look at the world of Hollywood memorabilia, be sure to tune in to Syfy’s new reality series, “Hollywood Treasure,” featuring Joe Maddalena, which will premiere Wednesday, October 27 with two back-to-back half-hour episodes at 10:00pm and 10:30pm. A review of the first two episodes follows the cut. TELEVISION REVIEW: SGU Returns with First of Shocking Two-Parter! 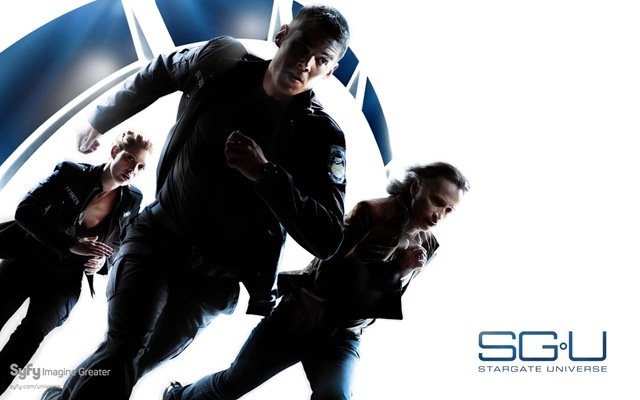 Tonight’s first spring episode of Stargate Universe [Syfy, 9/8C] is the first of a two-parter that finds Rush returning and introduces what could become a recurring species of aliens who seem to have designs of the Destiny. TELEVISION: Warehouse 13 – Not Just a Collection of Antiques & Curios! Remember the final shot of Raiders of the Lost Ark, when the crated up Ark of the Covenant is placed on a pile of boxes and the camera pulls back and keeps pulling back to reveal a warehouse the size of Rhode Island? Well, Warehouse 13 [Syfy, Tuesdays,9/8C] could very possibly be that warehouse. 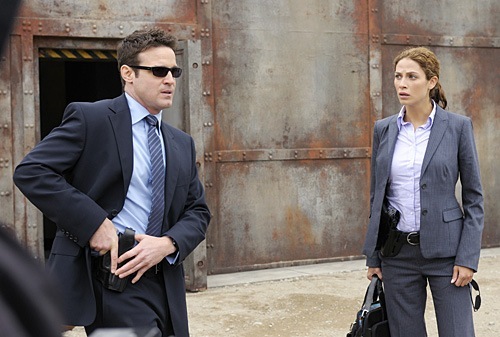 When two Secret Service Agents – Pete Lattimer [Eddie McClintock] and Myka Bering [Joanne Kelly] prevent a supernaturally influenced assassin from killing the President of the United States, they find themselves assigned to a very secret installation by the mysterious, and very determined Mrs. Frederic [CCH Pounder] – Warehouse 13 . TELEVISION: Sci Fi Channel Casts Bates, Scorsone as ‘Alice’ Leads! The Sci Fi Channel today announced the casting of the leads for its four-hour movie event that is scheduled for a December, 2009, premiere. 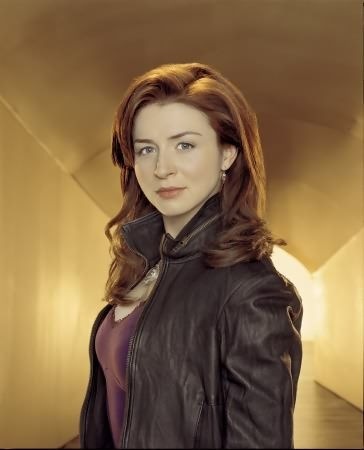 This updating of Lewis Carroll’s Alice in Wonderland will star Kathy Bates [Charlotte’s Web, Revolutionary road] as the Queen of Hearts and Caterina Scorsone [1-800-Missing, the upcoming Edge of Darkness – pictured] as Alice. Rounding out the cast of the mini-series, which has just begun shooting in Vancouver, B.C., are: Tim Curry [Rocky Horror Picture Show, The Colour of Magic] as Dodo, Colm Meany [The Commitments, Star Trek: Deep Space Nine] as the King of Hearts, Matt Frewer [Watchmen, Eureka] as the White Knight, Philip Winchester [Crusoe] as Jack of Hearts, Andrew Lee Potts [Primeval] as Hatter, Alessandro Juliani [Battlestar Galactica], as 9 of Clubs, Timothy Webber [Men in Trees, Taken] as Carpenter, Alex Diakun [Sanctuary, The X-Files: I Want to Believe], Zak Santiago [Driven to Kill, Young Blades], and Eugene Lipinski [Animorphs, Intelligence] as Doctors Dee and Dum. The writer/director is Nick Willing, director of Sci Fi’s Emmy-winning Tin Man. Executive Producers for Alice are: Matthew O’Connor and Lisa Richardson from Reunion Pictures, Jamie Brown from Studio Eight and RHI Entertainment’s Robert Halmi, Sr. and Robert Halmi, Jr.